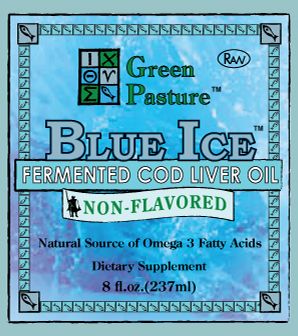 Have you ever heard of Fermented Cod Liver Oil (FCLO) and why it’s good for you? If not, check out a few posts here and here to see what they say about it. It’s basically known as a superfood and a good source of Vitamin A and D. FCLO is talked about a lot in the Paleo world since many people are followers of the Weston A. Price Foundation (WAPF) and he was a big believer in FCLO. His site is a great resource if you want to make your own baby formula, without having to buy the commercial stuff. I don’t get into WAPF too much, but I thought I’d give the Green Pasture’s fermented cod liver oil a try. It’s got a pretty overwhelming taste, so if you can’t stomach it by itself or in smoothies give this recipe a shot. I found it from my Facebook holistic group and Emma actually eats them here and there. She wouldn’t quite finish the whole gummy but at least it was a start. Personally, I tried to add the FCLO to my smoothie but it was pretty over powering (I ordered the plain from here). Then, I filled up the syringe that came with it, and let Emma help give it to me. Boy did she! She shot both squirts into my mouth when I wasn’t quite ready for it. That was okay. I figure sometimes it’s better to just take things straight up instead of trying to disguise it and prolong the inevitable. Without further ado, here is a recipe for FCLO gummies that hopefully your little ones will enjoy. Play around with the juice if you like. I think next time I will try fresh squeezed pineapple juice instead of the orange. 1. Whisk together over low heat until everything is smooth and melted. It only takes a few minutes at most. Optional: You can pour into a blender and blend for a few second until smooth. 2. Pour into molds and put in the fridge until set. After they come out of the molds, put them in a container and keep them in the fridge. ~Using 2 tsp of mixture for each gummy should come out to 40 gummies. That would make 2 gummies = 3/4 tsp of FCLO, which is a serving size of the emulsified. ~If you use regular FCLO, each gummy has just over 1ml of FCLO. Since 2ml of the regular FCLO is a serving, 2 gummies would still be a serving. ~The licorice works really well with grape juice, and cherry juice. wonder how this would work with the new infused cod liver oil? The cinnamon flavor is amazing enough to eat off the spoon without chasing it with something. Nevertheless, there are those who still turn their nose up at it. Also, would it not be best not to heat the cod liver oil at all, and just add it in after the gelatin is melted and cooled to a point? I wonder how this would work with the new Infused cod liver oil that Green Pasture has recently brought on? Seems you would have to ingest a bit more? I remember the cinnamon gummies they made a while back, and I thought the cinnamon flavored infused might be awesome. I do have one concern. I’m sure you are using low heat, but might it not be best to get the gelatin melted and started cooling before adding the FCLO? I think I would even add the honey when cooled, as well. A great tasting honey is Y.S. Raw Honey. It tastes less like honey, and more like sugar with a hint of citrus. That’s a good idea to add the FCLO afterwards! I’ve heard about the cinnamon tingle and think I need to try that next-Emma isn’t too keen on the plain version. i’m not talking about the cinnamon tingle. That is straight cod liver oil. I am talking about the new cinnamon infused. It’s high vitamin butter oil, skate liver oil, and cod liver oil in a base of coconut oil. They have three flavors: cinnamon, caramel, carob banana, and then an unflavored version. They are 32oz containers. You take 1/2 TB as a serving…the larger serving because of the coconut oil. oh, I was hoping the oj was a good cover up? Anyway, these coconut infused are much milder as far as cod-liver oil goes, because they are ‘diluted’ as it were, in the coconut oil. So, to me, the taste is awesome. I thought they had improved a LOT with the ginger emulsified(but I still had to chase it with a swig of milk), but when I got the infused, I can now take it straight off the spoon and have NO need to rinse my palate. Anyway, that’s my experience. Good to know! I will have to check those other flavors out. where did you get your molds? They are really pretty! Actually, the one pictured is from a cake decorating store. thank you–I’m off to buy my molds! Bless! My sister pointed me here and I tried your recipe. I bought several bottles of the ‘kid-friendly’ emulsified stuff a couple of years ago and they’ve sat almost untouched in the top of my fridge ever since. We’d tried to find ways to choke it down with no success before this. Tried syringe, thick juice, etc. with no luck. Thanks for your recipe. You. Are. A. Genius! I will definitely have to give your recipe a try when I get my next batch in! Just don’t use the extra gelatin I did. lol. It made them a little too hard for winter time. It didn’t need it. They taste great and the kids chew them right up, but I have a problem eating them because it’s sort of like a rubber ball due to the cold. We just ran out so I’m thinking that I’m going to make them with just the amount you called for previously. lol. Ha! Whoops 😉 Yeah, they are quite a weird texture in the winter. 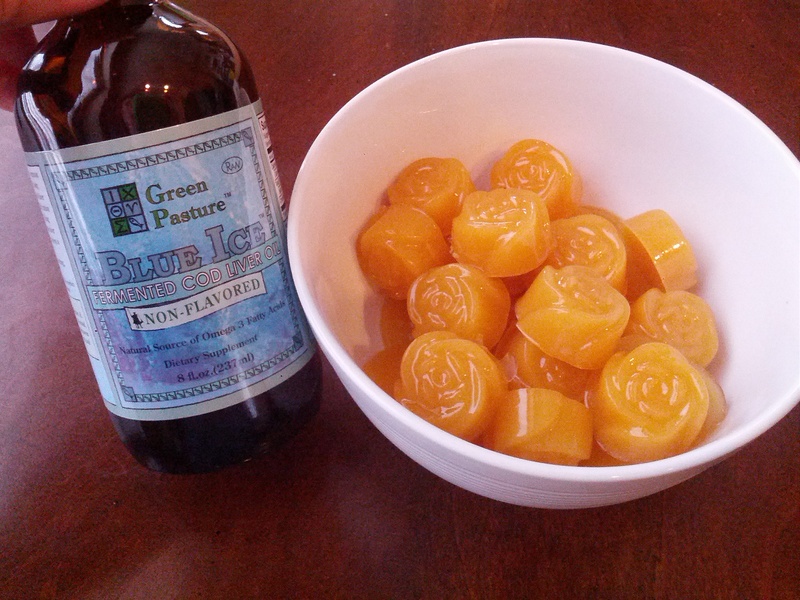 I just found a recipe for Kombucha gummies that I’m excited to try…just need to get more gelatin! I thought you aren’t supposed to heat FCLO? Although I’d love to put it in gummies, this is the reason I’ve never tried. I know, I’ve heard that, too, but I think that’s the only way to get the gelatin to dissolve. Hopefully, heating it over the low heat doesn’t kill too many properties. Thanks for a great recipe base! I used whole apple juice, raw ACV, cinnamon tingle FCLO and great lakes gelatin. I used a citric acid sugar blend but that doesn’t seem to being sticking too well. Thank you so much for the recipe! I finally made some and put them into fridge. I tasted it before pouring into molds and it was delicious! I modified the recipe a bit. I mixed 1/3 cup fresh orange juice with 2 tbsp of kosher gelatin, added 4 pinches of stevia extract and heated in double boiler. Removed from heat and stirred in 2 tbsp of raw honey. Than added 2 tbsp of Cinnamon flavored FCLO, half capsule of sunflower lecitin as an emulsifier, 1 tbsp of butter oil. … I hope my toddler likes the gummies! You’re welcome! Love the modifications…I will have to make them again with my Cinnamon Tingle and try your additions 🙂 Here’s hoping your toddler likes them! No. He did not like it. Never even tasted. He smells and knows there is a fish oil (FCLO). :):) I gave up and ordered some other WAPF recommended non fermented brand which arrived yesterday and it tastes delicious. Btw, I am no longer using stevia extract (did not know it is actually not that healthy). Oh boo 😦 I will have to check that brand out! Thank you for this! All the gummy recipes I kept finding were saying that fish oil wouldn’t work! Was struggling to get my fussy won’t-try-anything-new-ever 6 year old to take fish oil. These came out perfect and were soooo easy. I only heated the juice & gelatin, then let cool a few minutes before adding the honey and fish oil. Wisked like crazy to emulsify and poured into wax paper lined pan. They set perfectly (actually a bit too much gelatin as I think mine is a bit different than the Great Lakes one) and he eats them – joy!! I put FCLO in Chocolate Almondmilk, my LO cannot even taste it, and I even use it after I take my shot of FCLO, only thing I have used to get that fish taste out.